If you want to use videos or voice of any person to be used for commercial or non-commercial purpose for your organization, institution or any reason then you might have fear of whether the person associated with the audio or video may sue you for using his images, video or similar content. So why not to go ahead with a secure step? That secure step is offered to you by video release templates and Interview Release Form. A video release template is a form duly signed by the person whose images or sounds have been used in the video granting legal permission for using videos or motion images. With this you will not have to worry about any of the legal disputes and you can utilize the videos for any legible reason. Here are a few great video release templates that you can use to have video release permission. 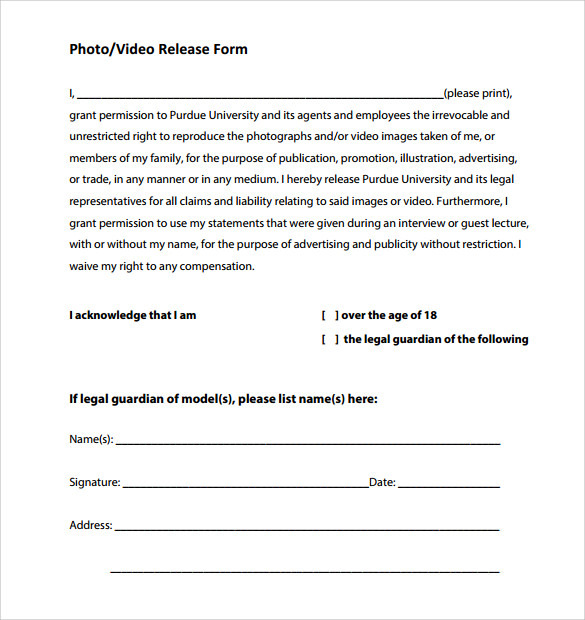 This is one sample video release form template that grant permission for a University or any educational institution for using video, audio, voice or more of a person. The associated person will sign at the bottom of the form to grant the video release permission. This template is fully customizable hence the name of university and more can be changed as per individual college, school or institution needs. 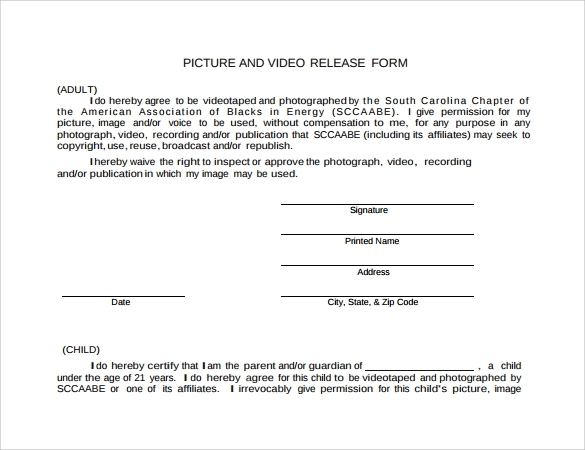 You can also utilize this video release form sample to have the permission granted for using pictures and videos of a person or child for your commercial or non-commercial cause. In this template there are two different sections one is for adult and one is for child. If you need to have permission for child’s video and picture content then his/her parents will be granting the permission through this form. 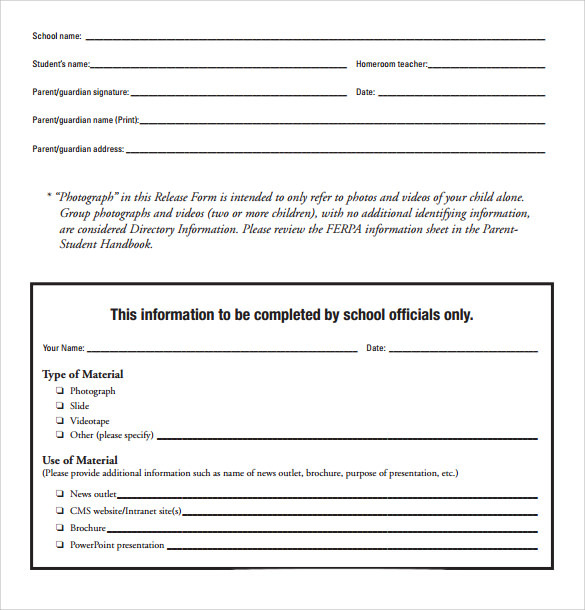 This is a video release form for students who want to use videos of any person or his/her child for a wide range of purposes. 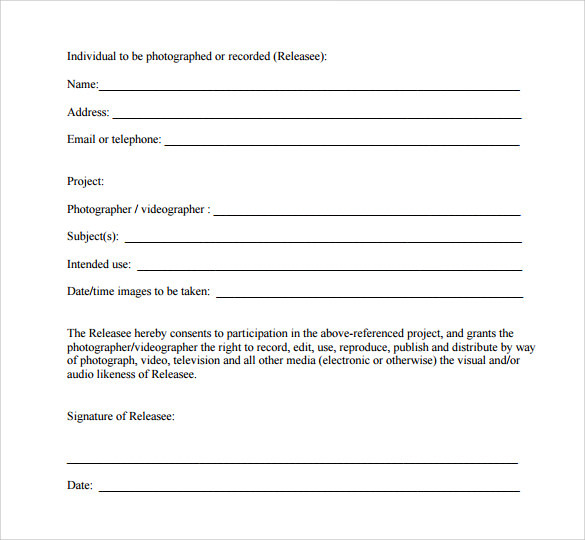 This form include different sections explaining how the video will be used. The associated person need to grant the permission for by putting his/her initials to agree for each of the uses. This form is best to be utilized by students who are involved in any type of research and want to showcase their work through recording, images and more. Are you planning to use someone in your videos or motion images for any commercial or non-commercial intent? 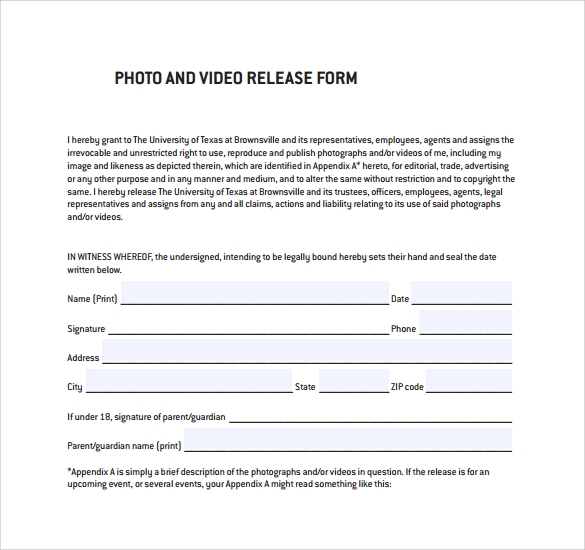 Then video release form template is the right solution for you to protect your rights and stay out of trouble. There is a possibility that the person, whose videos and images you are planning to utilize may bring you to the legal matters in future for causing damage to his/her reputation for your personal benefit. And this may create a big legal issue for you. 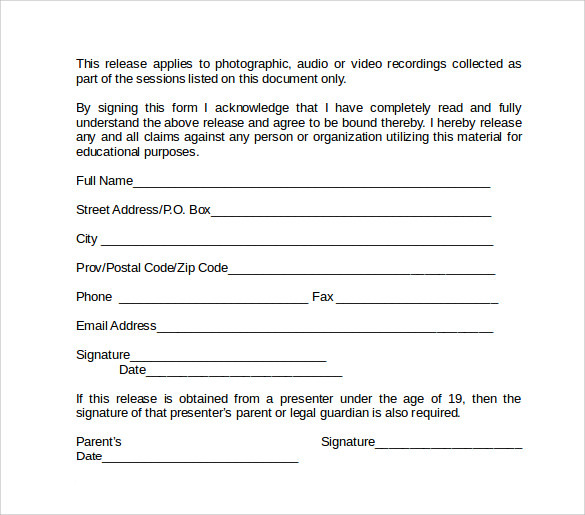 So to protect yourself in advance these video release form templates and Film Release Form Templates are best options. These help you have the permission granted by that person for using his/her videos and images for your organization or business. These templates let you explain all the areas where those videos will be utilized thus giving you a legal permission. The target audience of template video release form can be everyone from individual and student to any business, government organization, institution, college, school or more that want to use videos or images of any other individual. A student may want to showcase his/her research he has completed along with publicizing videos of any person that are created during research. 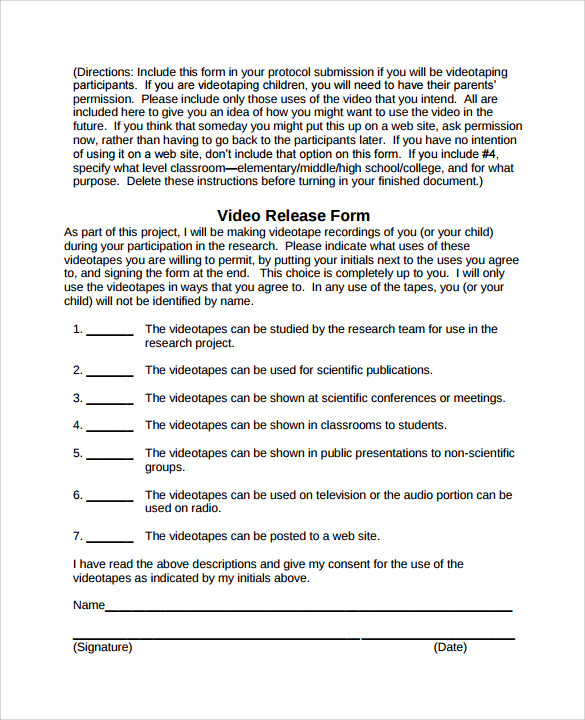 So a student may also need to use these video release templates to have permission grant. In the same manner if any institution or business may be interested in using such videos of an individual then these video release form templates and Image Release Form Templates are required for permission. Hence the target audience of video release templates include all the individuals, organizations and businesses that want to legally use others videos, images or motions pictures for their personal benefits. Legal Right of the Video – By using a video release signed by the person whose video you are using, you can have the legal right of the video and you can utilize it for your private event or concern that are specified in the video release form. The video release templates are prewritten and can be customized as per your requirements to add personalized names and areas where you need to have permission of the concerned person. Keeps You out of Trouble – These forms provide you a great way to stay out of the trouble as you can already have permission of the concerned person. In the absence of any such video release form you might be answerable to the person legally for using his/her videos and pictures for your private commercial or non-commercial use. So these may help you stay out of such legal trouble. This is all about the importance of video release forms that you always need to use whenever you are planning to use any video content of a person. You can find video release form templates online and can customize it as per your needs and this will act as a solid support for you to keep you and your business or profession out of various legal consequences.